U.S. stocks recorded solid gains for the week and most major indexes are now back within 2% of their all-time highs, set last September. 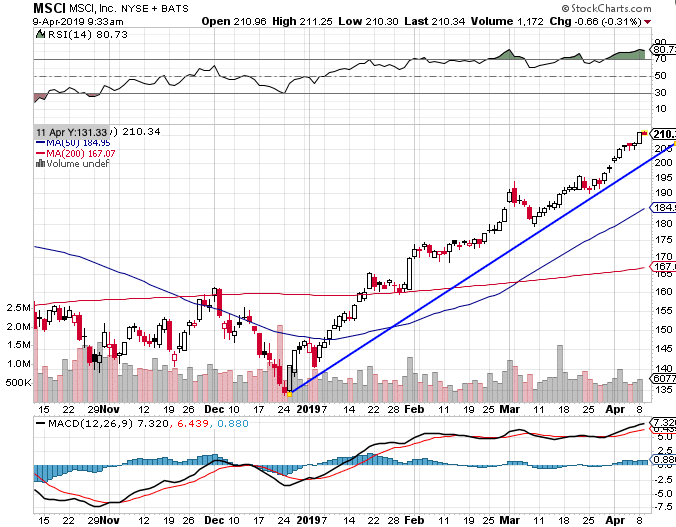 The S&P 500 index recorded seven consecutive days of gains, its longest winning streak since 2017. The Dow Jones Industrial Average added 496 points last week to close at 26,424, a gain of 1.9%. 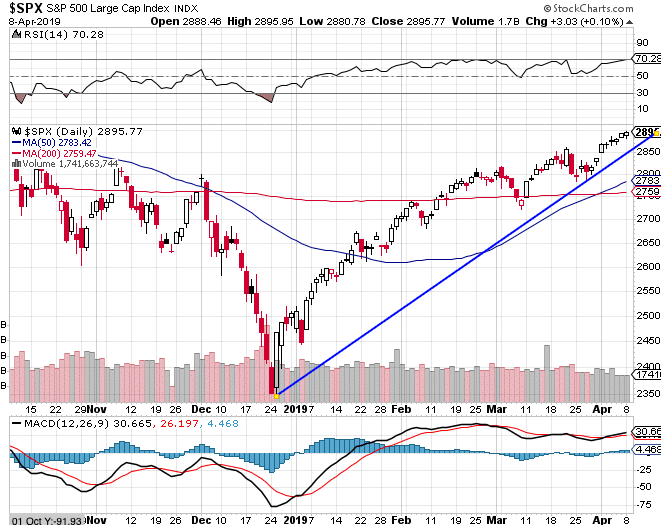 The technology-heavy NASDAQ Composite gained 2.7% and closed at 7,938. By market cap, the large cap S&P 500 rose 2.1%, while both the S&P 400 mid cap index and small cap Russell 2000 index added 2.8%. All major international markets finished in the green last week. Canada’s TSX rose 1.8% and the United Kingdom’s FTSE added 2.3%. On Europe’s mainland, France’s CAC 40 gained 2.4%, Germany’s DAX surged 4.2%, and Italy’s Milan FTSE rose 2.2%. In Asia, China’s Shanghai Composite jumped 5.0%, while Japan’s Nikkei added 2.8%. As grouped by Morgan Stanley Capital International, developed markets rose 2.1%, while emerging markets surged 3.5%. Precious metals were weak, reacting to strength in the stock markets. Gold retreated -0.2% to close at $1295.60 an ounce, and Silver also finished down -0.2% at $15.09 per ounce. Energy continued to be bid higher, now up five consecutive weeks. West Texas Intermediate crude oil surged 4.9%, closing at $63.09 per barrel. 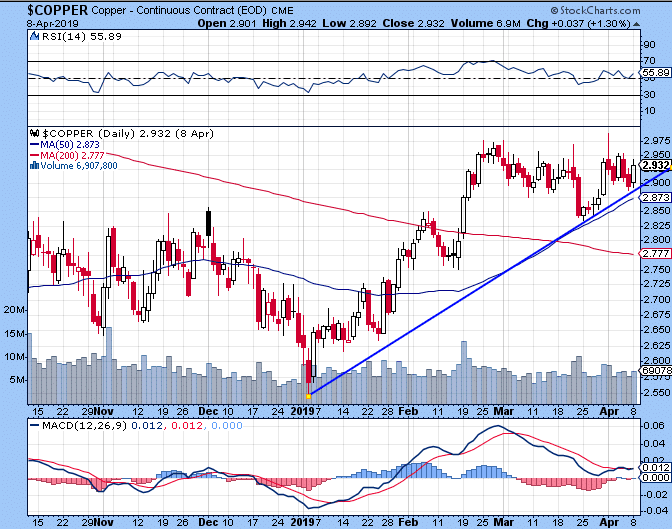 The industrial metal copper, viewed by analysts as a barometer of global economic health due to its variety of industrial uses, retreated -1.4% last week. The number of people applying for first-time unemployment benefits at the end of last month fell to their lowest level in almost 50 years—a very reassuring sign for the economy amid other reports which hinted at slower growth early in the year. The Labor Department reported initial jobless claims fell by 10,000 to 202,000. Economists had forecast a reading of 216,000. 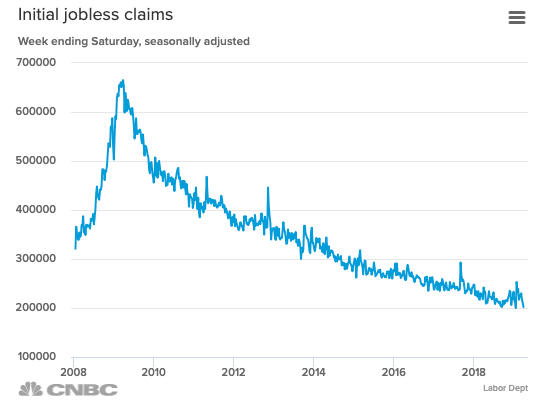 Jobless claims have fallen three weeks in a row and are down sharply from the beginning of the year. The downward descent is also apparent in the less-volatile monthly moving average of claims, which fell by 4,000 to 213,000. That number is at its lowest level since October. Continuing claims, which counts the number of people already receiving benefits, slipped by 38,000 to 1.72 million. The U.S. economy added 196,000 jobs last month, handily beating economists’ forecasts for 179,000 new jobs and a positive sign of the health of the U.S. economy. Hiring increased in most major segments of the economy, especially among health care and white-collar employers. Health-care providers led the way with 49,000 new positions added, followed by professional and technical firms, which added 34,000. Orders for “durable goods” (goods expected to last at least 3 years), slumped in February largely due to fewer orders for commercial aircraft and defense-related hardware. The Commerce Department reported durable-goods orders sank -1.6%, however the reading was better than the forecast of a -2.1% decline. It was its first negative reading in four months. Stripping out the volatile transportation component, orders actually rose 0.1%. Core capital-goods orders, a key measure of business investment, fell for the third time in four months—down -0.1%. Business investment has been flat for the last three months and up just 2.6% over the past year. That is down sharply from the 10% year-over-year pace seen a year and a half ago. 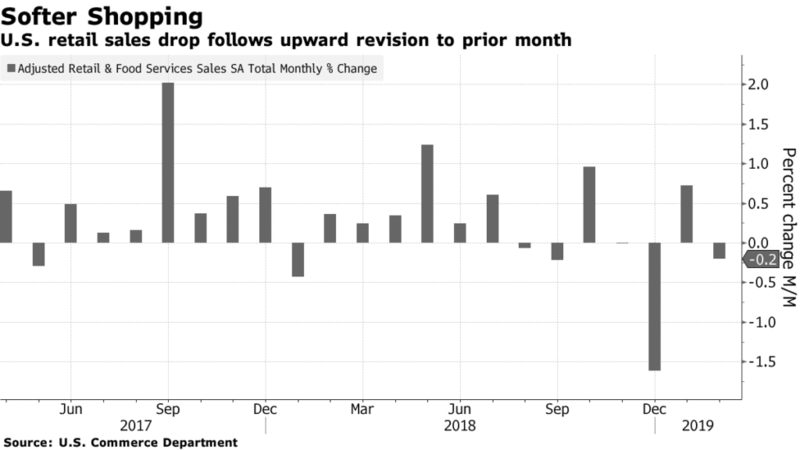 Sales at the nation’s retailers fell in February for the second time in the last three months, according to the Commerce Department. The weaker sales number was another sign of the slowdown affecting broad areas of the U.S. economy. Retail sales declined -0.2% in February, far lower than the 0.3% increase economists had expected. However, offsetting the decline was a bigger gain in January than was initially reported. 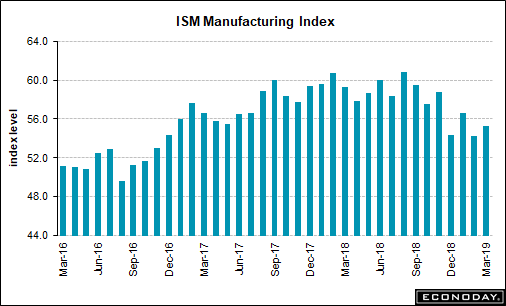 The Institute for Supply Management (ISM) reported its index of manufacturing activity rebounded last month, after hitting a 2-year low in February. ISM’s manufacturing index rose to 55.3 from 54.2, exceeding analyst forecasts of 54.6. In the details, the sub-index for new orders jumped 1.9 points to 57.4, while the production sub-index rose 1 point to 55.8 and the employment sub-index surged 5.2 points to 57.5. In the services sector, ISM reported growth at its slowest pace in over a year and a half, but firms remain “optimistic”. ISM’s non-manufacturing (services) index retreated 3.6 points to 56.1 last month, but that was down from one of the highest readings in decades. 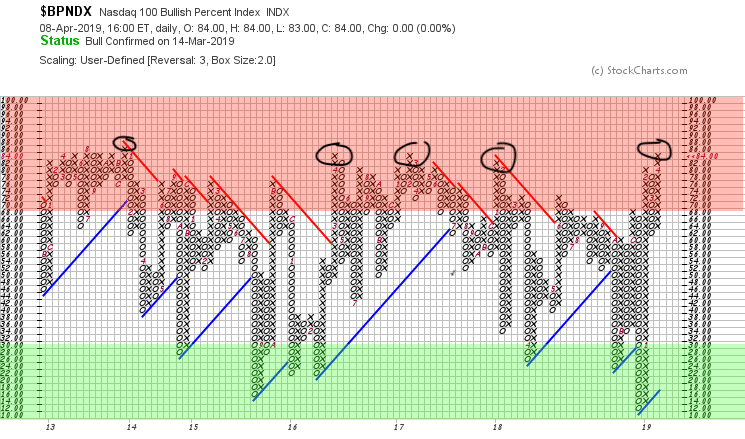 The current status of the NYSE bullish percent index is telling us that the US equity market is still in a “distribution phase”. This indicates that investors are selling into the current strength of the market. The NASDAQ 100 Bullish Percent Index has thrust higher into overbought territory (and high risk). 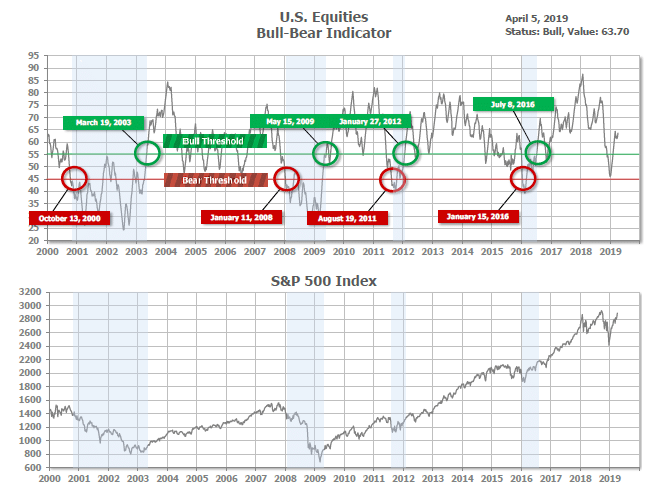 Currently, the index is at a level where sellers start to step in. 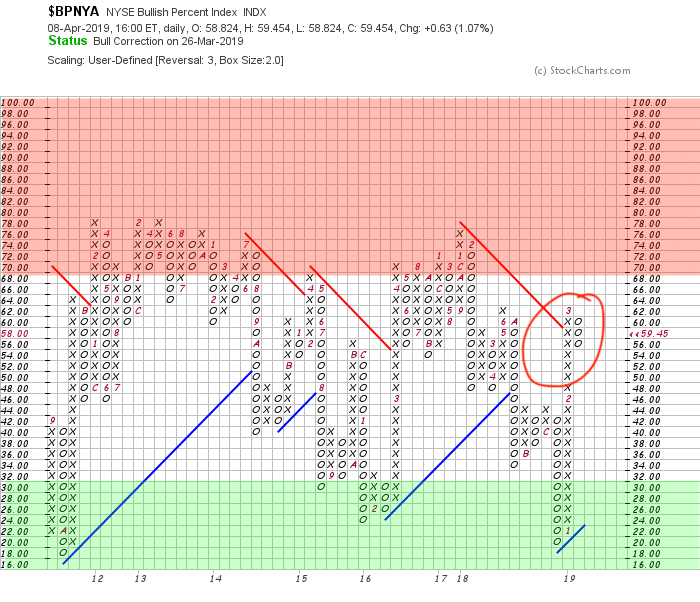 The Bullish Percent Index is showing increased volatilty in most sectors. 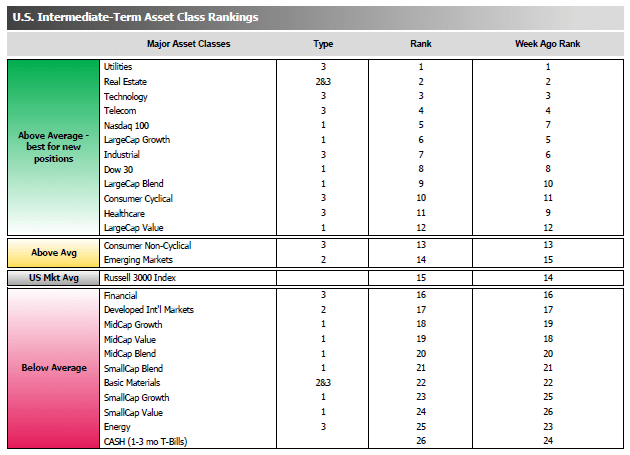 Technology, Real Estate, and Utilities are very overbought. The average ranking of Defensive SHUT sectors declined to 7.25 from the prior week’s 6.75, and the average ranking of the Offensive DIME sectors also declined to 16.00 from the prior week’s 15.50. The Defensive SHUT sectors maintained a lead over Offensive DIME sectors. A common mainstream-media portrayal of “anti-vaxxers”, or parents who opt out of getting their children vaccinated, is that they are backward anti-government conspiracy theorists who reside predominantly in rural enclaves in “fly-over” areas of the country. However, recent data from health insurance giant Blue Cross Blue Shield suggests otherwise. 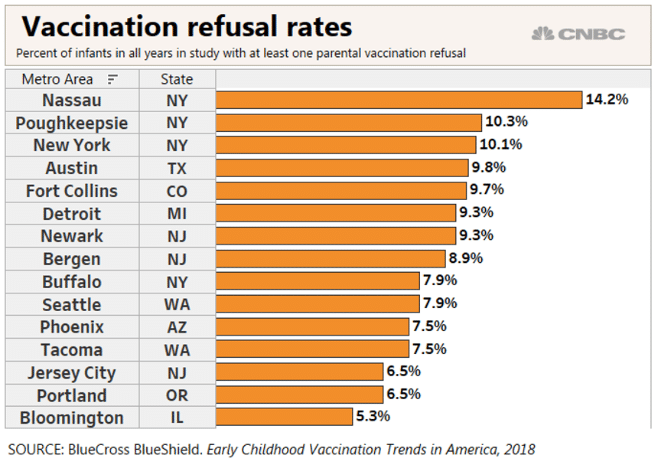 Their data, from a 2018 study, shows that the highest percent of parents who have refused to have their children vaccinated in the entire country were found in and around…New York City! The Eastern Long Island communities comprising Nassau County, New York – home of some of the wealthiest and most sophisticated neighborhoods in the state and country – topped the list, and two other New York metro area entities, including New York City itself, round out the top three. We are still investing portfolios very conservatively. 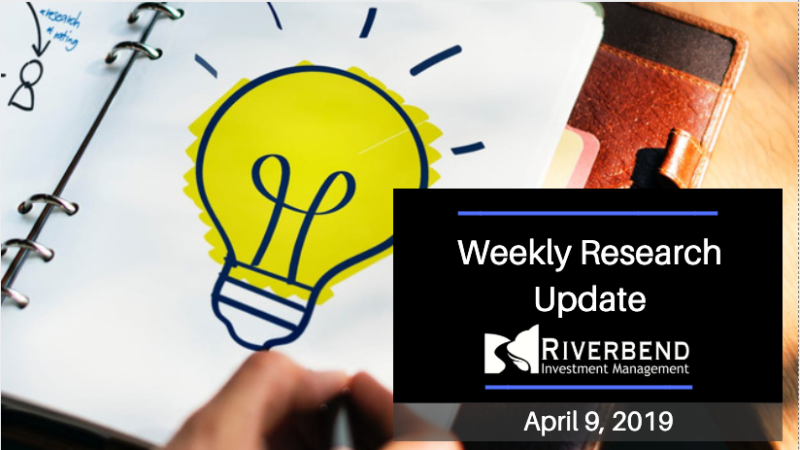 Our current objective is to protect the year to date gains in the portfolio as the market remains in high risk and overbought territory. Yes, the market has risen during the past week. I like to use the analogy of a light bulb burning brightest before it burns out. While markets can remain overbought for weeks, the current risk/reward ratio, in our opinion, isn’t worth putting capital at risk for a few extra percentage points.